The small scale of this piece makes it a perfect fit for a tight corner or smaller room, and you can easily customize the leather color to match with your existing decor. Sleek, minimal shapes make up this contemporary recliner, including rounded track arms and a tall-standing back cushion. Subtle decorative topstitching adds a bit of decorative contrast to this fashionable look. 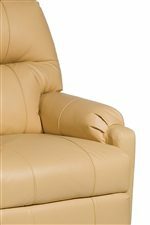 The Petite Recliners Costilla Swivel Glider Recliner by Best Home Furnishings at Best Home Furnishings in the St. Louis, Chesterfield, St. Charles, MO & Waterloo, Belleville, Edwardsville, IL area. Product availability may vary. Contact us for the most current availability on this product. 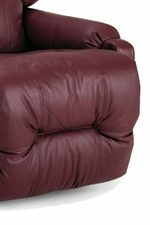 The Petite Recliners collection is a great option if you are looking for Contemporary furniture in the St. Louis, Chesterfield, St. Charles, MO & Waterloo, Belleville, Edwardsville, IL area.